Popularity wouldn’t be my initial reason for considering a particular luxury car, exclusivity higher on my list of desirable attributes. Still, the object of one’s eye needs to have achieved a certain level of marketplace acceptance in order to drive demand amongst pre-owned buyers, or its resale value will plummet as soon as you drive it off the lot. 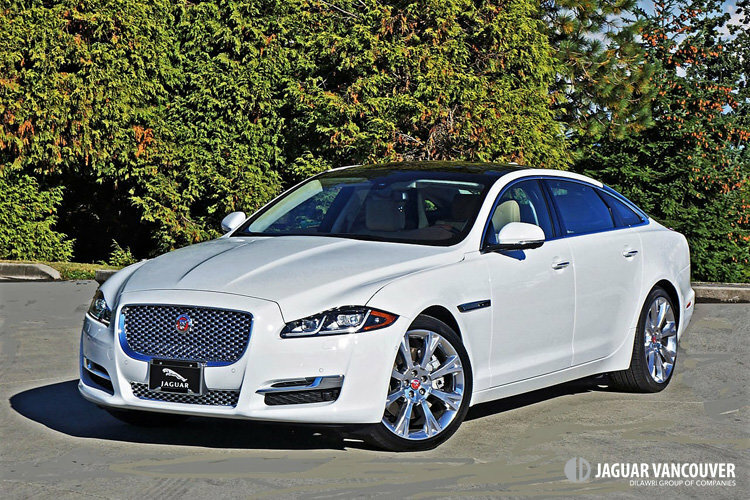 That’s just one reason why Jaguar’s XJ makes sense. Pedigree helps as well, and the storied British brand has loads of that. It’s a history rich in motorsport, and steeped in advanced engineering. What’s so advanced about the XJ? The majority of its body and chassis is constructed of lightweight aluminum. Granted, Jaguar isn’t alone in lightening its flagship sedan with advanced metals and composites, but no competitor comes close to the XJ’s street fighting curb weight. Truly, when you start comparing curb weights of the various long-wheelbase rivals, the XJ’s performance and efficiency advantages increase commensurately. Added to that, the XJ’s riveted aluminum monocoque chassis and body structure achieves near equal front-to-rear weight distribution for superb balance, while its also incredibly strong and rigid, which aids handling further, as well as allowing for more compliance from its adaptive air suspension for better ride quality, plus improved crash protection and the ability to utilize more than 50 percent recycled Al. As for its lighter weight contributing to fuel economy, the XJ is rated at 14.0 L/100km city, 9.0 highway and 11.8 combined, which is very good for the class. Sound like a win-win-win-win-win? It is. The result is a full-size luxury sedan that feels as substantive as anyone could want during high-speed highway cruising, but when straight turns to curve and opportunity for some switchback fun arises the XJ is one of, if not the most engaging in its class. I’d have to test them all back to back on the same stretch of road in near identical conditions to know for sure, because while most competitors are capable through the corners, there’s a liveliness to the fast cat that makes the rest seem like bumbling sheepdogs. OK, maybe that’s a bit of a stretch, but you get my point. Of note, the air suspension I mentioned earlier is Jaguar’s Adaptive Dynamics system that monitors speed, steering input, body movement and more up to 500 times per second, while continuously modifying damping rates to enhance performance and comfort levels. Less weight also results in a better power to weight ratio, which means the XJ’s dynamic engine duo are allowed to perform to their maximum potential. That would be 340 horsepower and 332 lb-ft of torque for my 3.0-litre supercharged V6 tester or alternatively 550 horsepower and 502 lb-ft of torque from the sportiest XJR. Other than to mention both engines utilize a state-of-the-art eight-speed automatic with manual mode, paddle shifters, JaguarDrive Control driver-selectable efficiency, Dynamic sport and winter modes, auto stop/start, and all-weather “Instinctive” torque vectoring AWD with All Surface Progress Control (ASPC) developed from Land Rover’s Terrain Response system for tackling slippery situations, resulting in zero to 100km/h sprint times of 6.4 and 4.6 seconds respectively, as well as top speeds of 195 and 280 km/h apiece, I’ll leave comments about the latter car for a future review, and instead focus on the version in hand. With Jaguar’s motorsport proven performance pedigree safely intact, and Ian Callum’s stunning exterior styling so obviously above par that my mumblings could hardly do it justice other than to say the 2016 model receives a mild refresh including a nicely reworked grille and lower fascia incorporating larger corner ducts, standard LED headlamps with J-shaped driving lights, oval exhaust pipes, and other small details, the majority of updates were focused on the interior, particularly the fully reconfigurable TFT primary gauge cluster that receives higher resolution, quicker response, better graphics, and the ability to display navigation mapping across the whole screen, plus the infotainment system atop the centre stack. InControl Touch Pro is much more intuitive design than the previous interface, as it works more like a smartphone or tablet thanks to finger gesture capability such as swiping and pinching, while it also incorporates a much faster and more shock resistant solid-state hard drive, plus a more powerful quad-core processor. Additionally, the wireless connectivity works better and voice control now allows full dictation of addresses for easier use of the navigation system. What’s more, once the system gets to know you it will suggest alternative routes to escape traffic congestion. Possibly its best update is a $1,000 optional surround parking camera system that not only displays a bird’s-eye view of the surrounding area, but when you’re 200 meters away from your preprogrammed destination the monitor will attempt to direct you to available parking spaces; front and rear parking sensors are also part of the package. Lastly, a new smartphone app will prep your XJ before you get there by starting the engine and adjusting the climate control, or if you can’t find your car it’ll locate it and then unlock the doors upon your arrival. There’s much more to the app and InControl Touch Pro system, but rather than going into every last detail hopefully you’ve been inspired to have some fun with it. Much of these features come as part of the $1,300 InControl Protect and Connect Pro Pack which was added to my tester, while my $99,000 XJL AWD Portfolio (the “L” tagged onto the XJ nameplate being short for LWB or long-wheelbase, which adds 127 mm / five inches of rear legroom) also included the aforementioned 360-degree parking camera and sensors, a brilliant set of 20-inch polished Orona alloys on 245/40R20 front and 275/35R20 rear P Zero Nero rubber for $4,500, a $350 heated windshield, a $500 heatable wood and leather-rimmed steering wheel, $700 worth of powered rear side sunshades, and $835 for branded rubber floor mats and wheel locks, the revised total being $108,185 before freight and fees. Of course, plenty of additional options could have been added, a rear entertainment system noteworthy due to dual 10.2-inch displays that fold 180 degrees into the seatbacks when not being used. You can also get a $1,700 Illumination Pack that adds illuminated tread plates and trunk finisher, phosphor blue illumination in the front and rear air vents, and rear LED reading lights; and an $8,500 Premium Rear Seat Package that removes the regular flip-down centre armrest seat and replaces it with a much more advanced one with integrated controls for the upgraded individually powered bucket seats with memory that also massage in three different styles, while retractable business tables and rear seat entertainment also get added. I’d also have to add the $4,200 26-speaker, 1,300-watt Meridian Reference Audio System, and not because of its unique conversation assist system, but rather for conversation blocking music nirvana (not necessarily the band, although some Seattle sound would be just fine too). Adaptive cruise control with stop-and-go is a must-have too. On that note, the XJ receives standard blindspot warning with fast-object detection and rear cross-traffic alert, while additional standard kit includes 19-inch Aleutian alloys, full LED headlamps with adaptive cornering and auto high beams, power-folding side mirrors, auto-dimming mirrors all-round, proximity access with pushbutton start, soft door close, an electromechanical parking brake, rain-sensing wipers, a power-adjustable steering column, a heatable leather-wrapped steering wheel, a 12.3 LCD primary instrument cluster, three-way heated and chilled front seats, 10-way powered front seats with three-way memory, leather upholstery, gloss burl walnut veneer, dual-zone auto HVAC, a garage door opener, the eight-inch full-colour InControl Touch Pro touchscreen with navigation, a rearview camera, 17-speaker 825-watt Meridian Surround audio, satellite and HD radio, Bluetooth audio streaming, a panoramic glass roof with a powered sunshade, a powered trunk lid, and much more. The move up from R-Sport (a new for 2016 designation) to Portfolio includes unique 19-inch Toba alloys (although as noted mine were upgraded further), a 20-speaker audio upgrade that was absolutely fabulous, superbly comfortable 14-way powered front seats with four-way lumbar and effective massage capability, gorgeous diamond-stitched quilted leather upholstery, four-zone auto HVAC, illuminated vanity mirrors in back, and more. And did I mention how beautifully everything inside is put together? All the leathers upon contrast stitched leathers plus sumptuous suede, premium soft touch surfacing, planks of burled walnut, brilliantly polished metals with some even knurled to jewel-like perfection, only a tasteful amount of piano black lacquer, and superbly crafted switchgear with nice, tight, well-damped fitment, the interior is as opulently finished as the exterior is breathtakingly beautiful. A simple black-faced analog clock is the ideal classic touch, and the JaguarDrive Selector continues to thrill all those uninitiated souls who haven’t seen something so beautifully sculpted power up out of the console, its practical and space saving applications also best in class. As you can imagine the extra rear space of this LWB model was overkill for my five-foot-eight height, although an enjoyable enough place to kick back and take notes let alone be chauffeured through town in. I wouldn’t be asking my driver to take me to the ski hill, however, as Jaguar doesn’t provide a pass-through to expand the usefulness of its otherwise large and accommodating 520-litre trunk, but such is not unusual amongst truly elite luxury sedans. After all, Jaguar now makes the F-Pace SUV for such activities, or you can opt for a full-size Range Rover, which is more in the XJ’s league. After time well spent in this most recent 2016 XJL I’m once again reminded that few of its luxury sedan peers fully measure up. As noted there are many that try, but when it comes to spellbinding styling, rich opulence, and jaw-dropping performance the XJ is hard to beat, while it holds its own in most every other category too (including earning the Strategic Vision Total Quality Award). It’s not the least expensive in its class, but when factoring in its standard features set and reasonable pricing for most options, the XJ offers up good value.